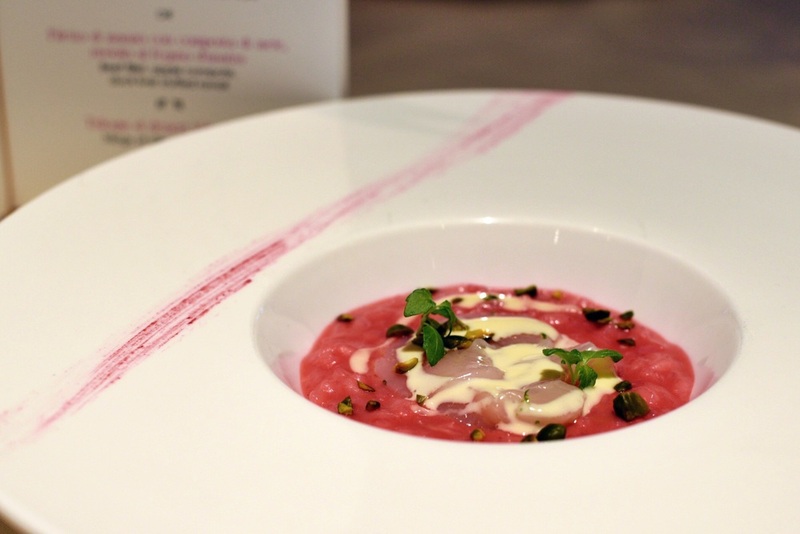 I previously wrote about the chance to experience the best of Villa d'Este (in terms of cuisine) at the Dolce Vita in Mandarin Oriental, Singapore. I was lucky enough to head down to Dolce Vita for lunch last week and had the rare opportunity to sample this amazing culinary experience by Guest Chef Michele Zambanini. Click HERE to read more about this promotion. The first dish I sampled was the Salt Cod Cream, Blue Lobster and Rosemary Chips. Firstly, it's beautiful in presentation and the rosemary chip is an interesting one for me. The cod cream had texture without being overly smooth. 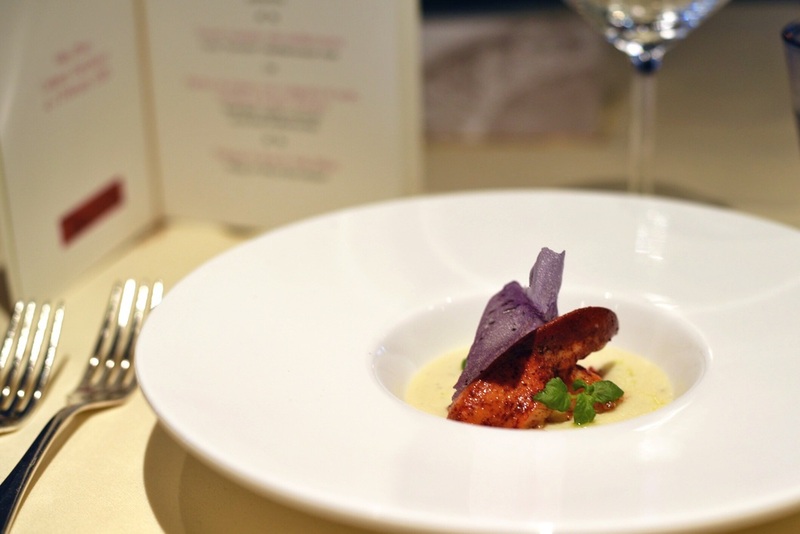 The overall saltiness of this dish was balanced with the natural sweetness of the blue lobster claw. The second dish, the Beetroot Risotto with Raw Scallops and Pistachios was an interesting one (and perhaps intimidating to some).Firstly, the beautiful shade of pink and red of the risotto is from the beetroot. Not only is the dish strikingly attractive in terms of looks, it also tastes amazing. While Chef Michele Zambanini usually uses shaved porcini mushrooms for the dish, he was substituted it with fresh raw scallops instead at the Mandarin Oriental, Singapore. The third course of the culinary experience is the Beef Fillet, Apple Compote and Duck Liver Stuffed Ravioli. The beef fillet has to be one of the best tasting meats I have ever had. The presentation is beautiful as usual and the duck liver stuffed ravioli has a creamy texture - what you would expect from a well cooked foie. 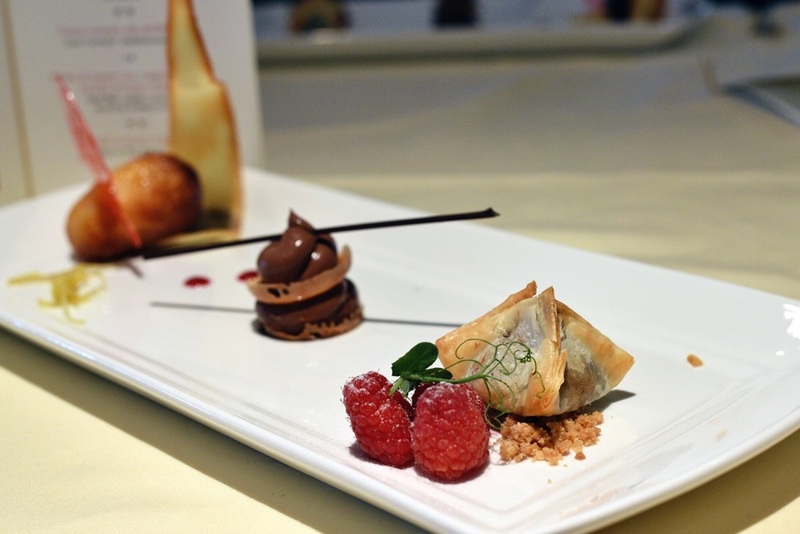 The final course of this four-course lunch is a selection of desserts from Villa d'Este. My personal favourite is the chocolate in puff pastry. My recent stay in Mandarin Oriental, Singapore's Club Harbour room has also been excellent - check out my stay here! This was an invited media-tasting session.